Locally abundant throughout Brunei. Elsewhere in Sarawak, Sabah and E Kalimantan. Clustering moderate rattan climbing to 30 m or more; stem without sheaths to 15 mm diam., with sheaths to 30 mm, internodes to 40 cm. 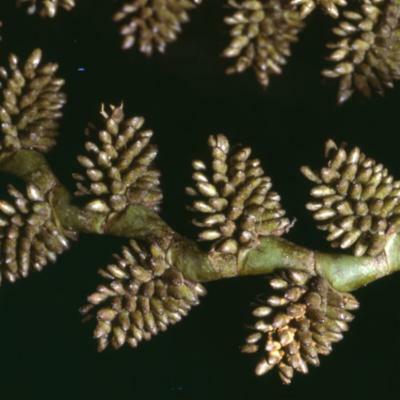 Sheaths bright green but covered in dense dirty-brown to chocolate-coloured scales and armed with scattered horizontal, flattened, brittle, black spines 5-25 × 2-4 mm, densely bearded with dirty-brown hairs along their edges; knee conspicuous, unarmed or less densely armed than the rest of the sheath; ocrea to c. 7 mm, fringed with brown hairs. 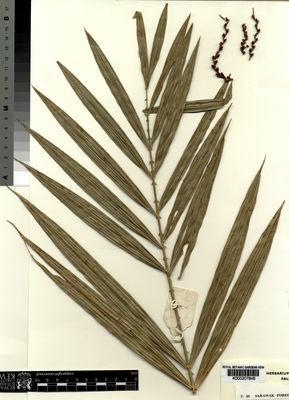 Flagellum to 3 m. Leaf ecirrate, to 2 m long including the petiole 10-30 cm long; petiole armed on the mid line of the lower surface with short hairy-margined spines; leaflets to 40 or 50 on each side, usually ± regularly arranged in proximal half and grouped irregularly in the distal half, or subregularly throughout, the most proximal leaflets to 45 × 1 cm, mid leaf leaflets to 35 × 2.2 cm, to 9 × 1 cm at the apex, bristly on 3 nerves on the lower surface, the upper surface ± unarmed except for a few bristles near the tip. 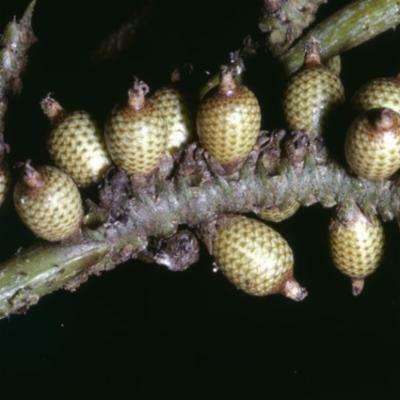 Male and female inflorescences flagellate, rather different; male inflorescence to 3 m or more with 4 or more distant partial inflorescences subtended by dirty-brown tubular spiny bracts, partial inflorescences limply pendulous to 45 cm, branched to two further orders, the ultimate branches bearing rather conspicuous triangular bracts each subtending a dense catkin to 8 × 3 mm composed of male flowers. 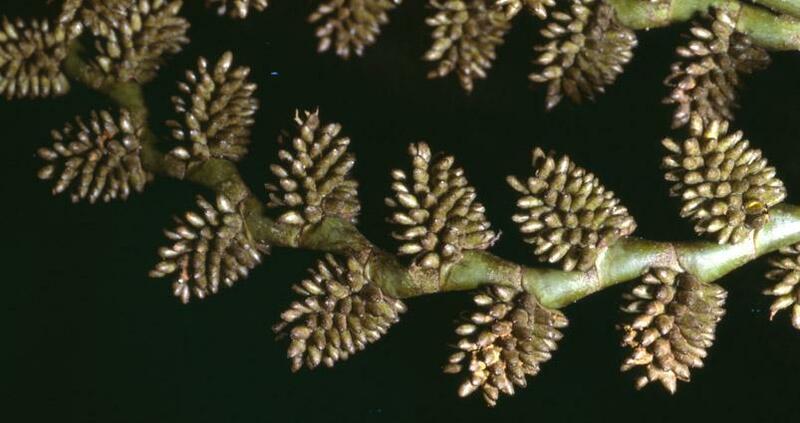 Female inflorescence much more sparsely branched, with 3-5 partial inflorescences to 40 cm, conspicuously dirty-brown bracteate, each bract subtending a rachilla to 8 × 0.4 cm. 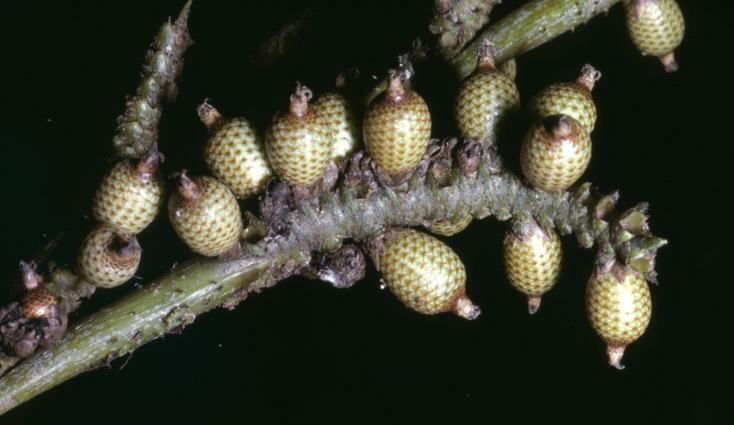 Fruit ± ovoid, with pale green scales (immature). Seedling leaf not known. (Fig. 69, Pl. 11C, 11D).